The chart comes from a report on the US MLP sector which outlined the valuation case for MLPs and yield comparisons across a number of different asset classes. The reason this chart is particularly relevant to the MLP sector is that it’s the shale revolution and the revival in the US energy sector which has been a key driver and thematic for that asset class in recent years (not to mention the search for yield!). 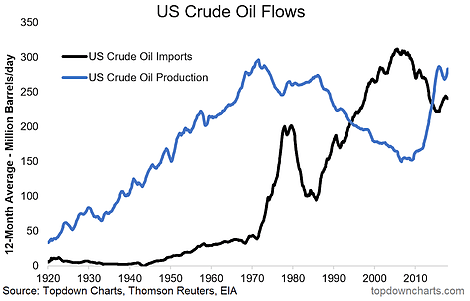 As I was saying, US oil imports averaged around 10% of total supplies from the 1920’s to the early 1970’s, and then grew to about two thirds in the mid-2000’s, as US crude oil production slumped to a 50-year low. More recently with the advent of advanced drilling and extraction techniques domestic production has once again become the dominant source. For how long is an open question. Aside from the direct impacts of these trends (on the oil & gas industry and energy infrastructure, not to mention the oil price itself) it goes to highlight a critical point for commodity markets: old paradigms of demand and supply can change, and at times be shattered by changes in technology. It’s important to keep this in mind when thinking about long term structural narratives for commodities. For example it may not be the case that agricultural prices go up forever because while arable land is theoretically limited, our capacity for innovation and technological breakthrough is not. Sometimes all that is needed is a surge in prices to mobilize the profit motive and accelerate such breakthroughs, as we saw over the past decade in the crude oil markets. One can only speculate what technological shifts may come next for commodity markets.